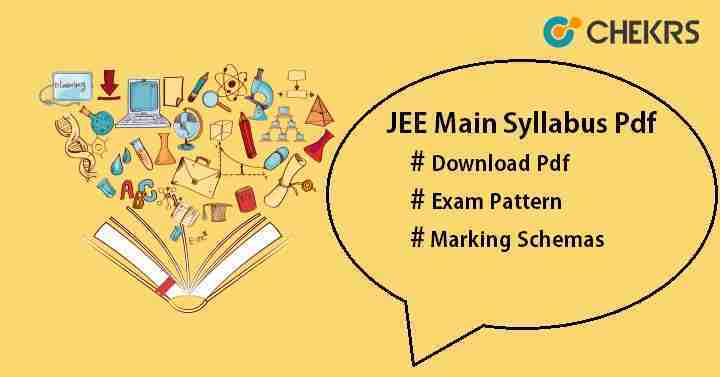 JEE Main 2019 Syllabus: JEE Main syllabus contains the syllabus of class 11 & 12 prescribed by CBSE. Applicants applying for JEE exam must know the syllabus set for JEE Main 2019. It will help to score good marks as candidates can prepare themselves according to the syllabus. Sketching of scenes & activities from memory of urban scapes (public space, festivals, market, street scenes, recreational spaces, monuments, etc. ), landscape (gardens, trees, river fronts, jungles, plants etc.) and rural life. JEE Main Exam Pattern: Now candidates can appear in JEE Main twice a year. JEE Main exam is conducted through online mode only as per rule prescribed by National Testing Agency (NTA). JEE Main exam pattern help students to know about the overview of question paper. Candidates must know the pattern of paper before appearing for the exam, as it guides how to attempt the paper and score good marks. Go through the given exam pattern of JEE Main for both paper. Paper will be held through online mode only i.e. computer based test. Total time duration will be 3 hours. There will be negative marking for each wrong attempt. -1 mark will be deducted for each wrong response whereas 4 marks will be allotted for each correct response. The question paper will be asked in 3 languages English, Hindi & Gujarati only. Multiple choice questions will be asked with 4 options for each question. The exam will be conducted in online mode only. 3 hours will be provided to complete the whole paper. Paper will be of total 390 marks. For each wrong answer, -1 mark will be deducted and 4 marks will be awarded for each correct answer. Tags:JEE Main 2019, JEE Main Application Form, JEE Main Exam Pattern, JEE Main syllabus, jeemain.nic.in.